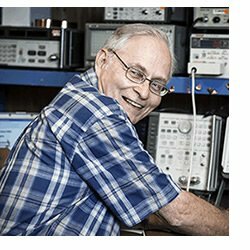 Meet the innovative engineers and team behind the RCA antenna legacy. The team at RCA encompasses more than 100 years of combined experience in designing and perfecting reception technology. RCA's goal is to bring you the best possible quality through our years of experience and development. 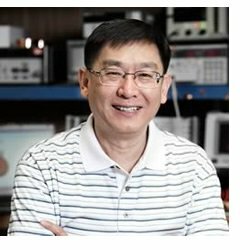 Tinaphong, known as the inventor of flat panel omni-directional antenna, brings more than 36 years of experience in the reception and antenna industry to RCA. His patented omni-directional design signaled a turning point in the antenna industry and led the shift from dipole or rabbit ears to the flat panel Omni-direction antenna. He also cooperated with NASA TecFusion™ to review and search for consumer applications of advanced technologies developed within U.S. government agencies. Tinaphong currently holds 15 patents worldwide and three design awards. In his spare time, he enjoys fixing cars. Recognizing the power of the first omni-directional multi-plane patented antenna developed by RCA's Paul Tinaphong, Caskey led the development of a complete line of non-traditional, flat antennas that drove the shift from rabbit ears to flat antennas at both the consumer and retail level. He was part of the industry team that worked with CEA to define the standards for antennas during the digital transition, and worked with the FCC and NAB to create educational materials for consumers to help them undergo this major technology shift. 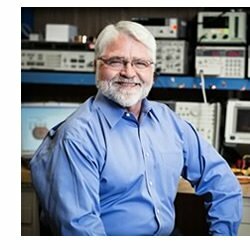 With over 17 years of experience in the industry, Caskey got his start practicing Morse Code in Boy Scouts and studying radio frequency engineering and antennas at The Naval Academy. Today, he holds two awards and has submitted seven patents. In his spare time, he enjoys fishing in his local rivers and reservoirs and watching the Army Navy football game. Reinhart joined RCA in 1968 after graduating from United Electronics Institute, and at that time he worked part time at a local TV station. He was instrumental in development of the first 100 DTV300 RCA HD Projection TV, hand-making the prototypes that were used during the congressional hearings and showcased at CES, NAB and other shows and press conferences. He also worked with DirecTV, Panamsat and Hughes to set up an HD satellite link to China to demonstrate satellite HDTV. He has submitted six patents and won three awards during his career. In his spare time, he enjoys amateur radio and hiking in the mountains out in the western U.S.